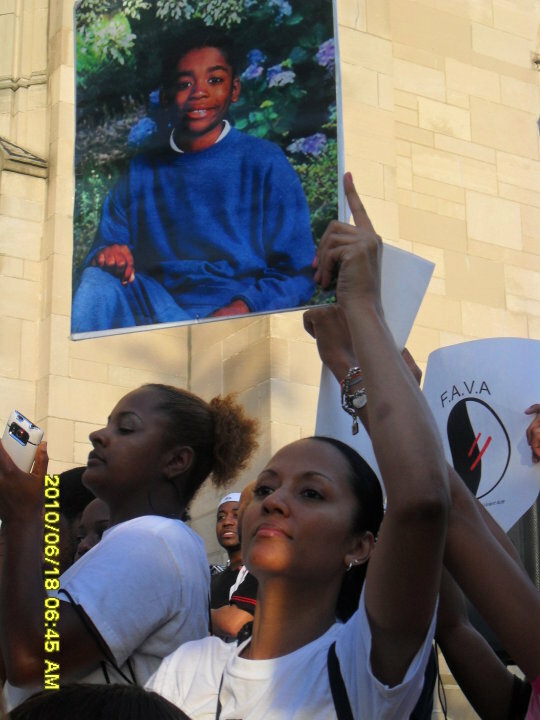 In losing my son Lazarus Jones at the age of thirteen to violence on February 19, 2007, my life took a turn. My vision and purpose is now primarily on the safety of all children. I was pregnant with my third son Israel Rome Bass when this tragedy struck me. I chose to use my pain as a source of strength and a voice against violence in honor of my son Lazarus. I began to Post flyers all over the city streets, stick my head in shop doorways and simply ask questions to try to get closer to the answer to all who murdered my son? I struggled to keep my emotions in check and to look people in the eye. In my soul I knew I could not break down. I said to God, please give me the strength and I had it. Looking for answer on how this could have happened, I marched against violence, choking back tears long enough to become a voice for my son. It has been painful,stressful,and from all that has happen with my son Lazarus now I have (PTST) Post Traumatic Stress Disorder I experienced a tremendous amount of anger, and I almost lost my faith in God. I told myself, I am his mother and this is what I have to do. The death of my son took a hunger and love from the pit of my soul that inspired me to be an activist for the safety of all children. The days that followed Lazarus murder were a blur of tears and sleepless nights, funeral plans and flashes of memory. But I recall one moment clearly, a phone call from a church pastor whom I never meet Rev. Charles Lyons of Armitage Church had heard about my son Lazarus death. Pastor Charles Lyons he gathered $10,000 in reward money and a prayer vigil at the site of were my son Lazarus was beating to death. I thank God for great angel like Pastor Charles Lyons. It was really devastating for me to even think about being there. But I did it because I knew anything I could do for my son Lazarus would help. On a frigid Sunday morning, six days after Lazarus death, I stood in the snow with about 100 others on the corner where my son Lazarus was killed. In a very weak voice, I spoke saying I forgave those who took my son Lazarus life. But I want them found, punished, kept from hurting another mother’s child. With the help from love ones we hung fliers announcing the reward throughout the neighborhood. I struggled to keep my emotions in check, to look people in the eye. I had to be my son’s voice, in my soul I know I can’t break down. God please give me the strength. Then my lips started to tremble and my eyes filled with tears. I have it but I’m dying inside. When we were done, I was exhausted. But for the first time in days, my head felt clear. After the rally I stay at my sister home. Waiting for police to call and say they had a suspect. This made me fueling to act. No one in suspect yet it’s been 3years now but I will never keep silence at all silence kills! I reach out to politicians, advocating for a police camera at the intersection where Lazarus died attended other meetings and prayer vigils. I spent time with reporters from a nearby high school newspaper, answering questions about my son that I know would make me weep. Anything to let people know the case was unsolved and the pain was still real. None of this was comfortable. But I had to learn that comfort wasn’t what I needed at all. What I needed was a way to keep living in a world without my son Lazarus. On March 29.2007 just five weeks after Lazarus died, I found myself at an auditorium at the University of Illinois, Max Cerda, a good friend who i meet the day after Lazarus was killed, from the Anti-Violence group Ceasefire summit on the widespread impact of gang violence. Told me to come with him on that day and I did, happy to say this was a bless day for a mother to be able to talk about my son Lazarus. The room was filled with academics and business executives. First Lady Laura Bush was seated near the stage. Secret Service agents and media lined the walls. I squirmed in my seat, wishing I could run back to my apartment to obtain some of my son's writings so I could share them, and then I realized I was in this place for a purpose. I spoke into the microphone and stated my purpose of being there in honor of Lazarus, “Hello, my name is Pamela Hester-Jones,” I said, “My son Lazarus was beaten to death on Feb. 19, 2007. Police still don’t know who killed my son Lazarus, but they continue to investigate. I've share all I had actively done, and all I was determined to do. I then attended and held many different events against violence. On April 23, 2007 while attending a prayer visual for another child, who was shot to death on the north Westside of Chicago, my water broke. After this I spent five weeks in Evanston Hospital. My son Israel was not due until July, but I had him on May 27, 2007. He was six weeks early. I thanked God for him on that day and every day to come. I held a safety back to school march in May of 2009 at the school Lazarus attended, Budlong School at 2701 W. Foster Av We marched from the school to Daman avenue then back. On Sep 26, 2009 I spoke as an advocate against violence in the community at Act Now Youth Organization kickoff celebration. On Oct 17, 2009 I held a Prayer Vigilant to stop the violence at Truman College, 1145 W. Wilson Chicago Illinois. I plan to continue being an activist in the community against violence. I collaborated with Wisdom Lives Here Founder Charlene Davis, United For A Cause Founder Dawn M Valenti , Friday Night Jam Pastor Donald Mayes, Purpose Over Pain and Blair Holt Peace Alliance Founder Annette Holt/ Ronald Holt, Peas In Their Pods Founder Gaetane Borders/ Janice Lowery Chief Executive Officer, The Black Star Project / I am Deborah It is my vision to be involved with other organizations to make a different in our communities.